The Thirty-Nine Steps, set during World War I, tells the story of Richard Hannay, who finds himself accused of murder and must battles both police and spies to prove his innocence. According to Wikipedia, it "is an adventure novel by the Scottish author John Buchan, first published in 1915...It is the first of five novels featuring Richard Hannay, an all-action hero with a stiff upper lip and a miraculous knack for getting himself out of sticky situations. John Buchan, 1st Baron Tweedsmuir (26 August 1875 11 February 1940) was a Scottish novelist and Unionist politician who served as Governor General of Canada. Buchan's 100 works include nearly thirty novels, seven collections of short stories and biographies of Sir Walter Scott, Caesar Augustus, and Oliver Cromwell. 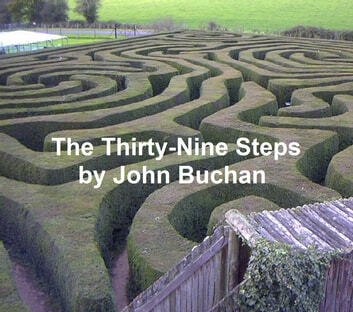 Buchan's most famous of his books were the spy thrillers (including) The 39 Steps (which was converted to a play as well as an Alfred Hitchcock movie starring Robert Donat as Richard Hannay, though with Buchan's story much altered.) The "last Buchan" (as Graham Greene entitled his appreciative review) was the 1941 novel Sick Heart River (American title: Mountain Meadow), in which a dying protagonist confronts in the Canadian wilderness the questions of the meaning of life. The insightful quotation "It's a great life, if you don't weaken" is famously attributed to Buchan, as is "No great cause is ever lost or won, The battle must always be renewed, And the creed must always be restated." The Red Badge of Courage: With 16 Illustrations and a Free Online Audio Link.